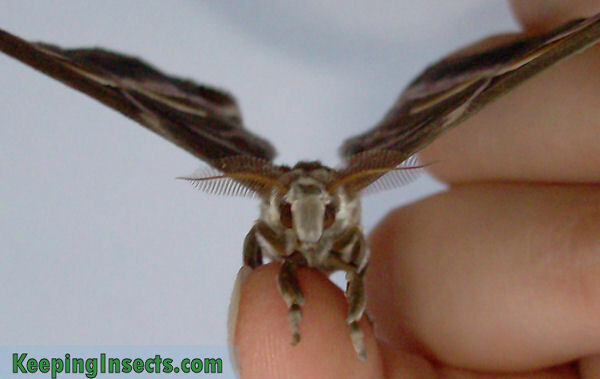 The Eri Silkmoth, or Ricini Moth, more scientifically Samia cynthia ricini, is a subspecies of the Samia cynthia moth. 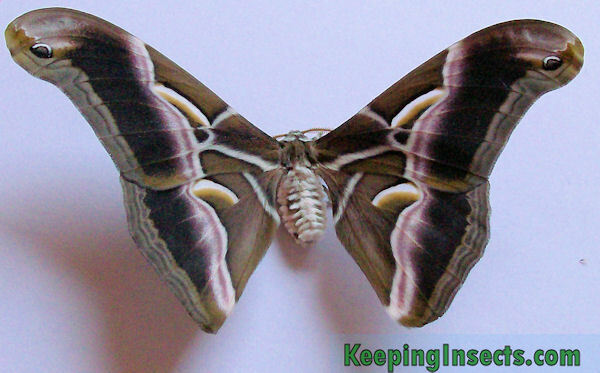 It is a beautiful big moth found in Asia. The caterpillars are really large and have beautiful white, yellowish or blueish colors. This caresheet deals with both Samia cynthia and Samia cynthia ricini. The care for both subspecies is the same. The Samia cynthia butterfly has a brown wing color in different shades of brown and has a beautiful purple stripe along the wings. They also have yellow spots and lines on the wings. At the tip of the wings is a small eye-spot meant to distract predators. The body of the moth is white with brown stripes. The wingspan of the butterfly is up to 15 cm. The caterpillars look really pretty. When they are born they are very small (0.5 cm) and have a green color with a black head. 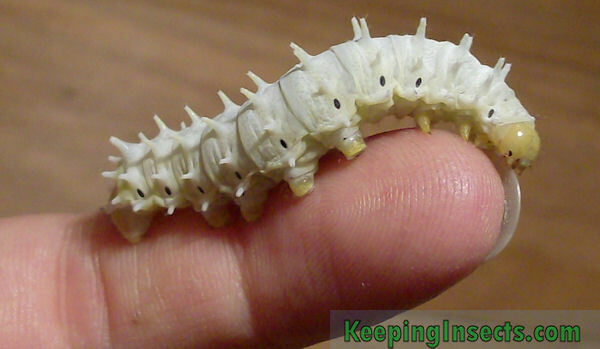 When the caterpillars molt to their next instar, they become whitish. When they are bigger, they are completely white with a yellowish or blueish hue. On their body are small extensions and their head is yellow. They grow very fast, the caterpillars grow up to 7 cm long in one month. 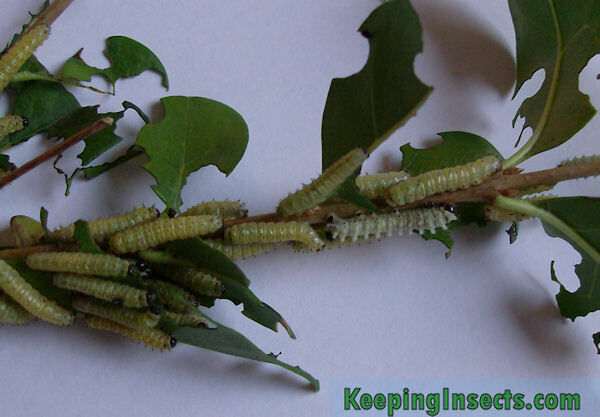 The caterpillars of the Ricini Moth eat privet leaves. They can also eat castor bean leaves, cherry leaves (Prunus sp. ), rose leaves, laburnum (Laburnum anagyroides) and ‘Tree of Heaven’ leaves (Ailanthus altissima). 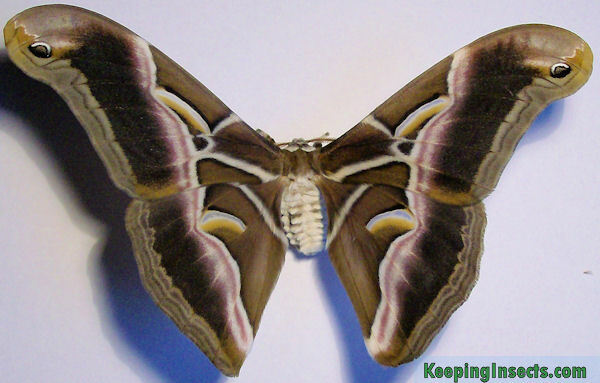 In nature or in moth farms they are fed with Tree of Heaven leaves, but they can also be kept exclusively on privet. The adult moths do not eat. They have no mouth! A consequence of not eating is that they will not live long, generally about 8 to 10 days. The caterpillars eat most of their time, all day and night. They molt five times. They do this by gluing their feet on the ground and then just walk out of their old skin. When the caterpillars are going to pupate, they spin a white cocoon in a corner of the enclosure or between branches and leaves. Inside the cocoon the caterpillar becomes a pupa. The butterflies do not fly much, but sometimes the males will fly in the night. Females can be picked up easily without restraining them, they rarely fly. If you want to pick up a butterfly, NEVER grab the wings. You can coax the moth on your hand by touching it at the feet and letting it step on your hand. The caterpillars and butterflies cannot bite or hurt you, they are completely harmless. The ideal temperature is about 25 ° C, but room temperature (20 ° C) is fine for these animals. The lower the temperature, the slower the growth. Caterpillars should never sit in a too damp environment, because they can develop problems with bacterial infections. You can hold the leaves you feed to the caterpillars under the tap to moisten them. That is enough moisture for the caterpillars. Keep the enclosure very well ventilated. A suitable residence for the caterpillars is a plastic box with lots of ventilation. For example by a mesh cover. You can put the leaves you feed them in a cup of water to keep them fresh, but you can also lay them down in the enclosure and remove them when they are withered (or eaten). At the bottom of the enclosure you have put tissues to allow easy cleaning. You have to change the tissues once a day and replace them with some clean ones. If you find cocoons, you can collect them and hang them in a special enclosure suitable for eclosion of the moths. How to hang the cocoons can be read here. The moth should have a lot of space, but their enclosure should not be made of glass or plastic. Mesh with diameters smaller than 2 x 2 cm is good. Some people set the moths free in a room, then they obviously have the most space! The room should be safe for them though. The caterpillars eat 35 days long, until they pupate. The pupa develops within 3 weeks to a butterfly. The butterfly lives between 5 and 8 days. 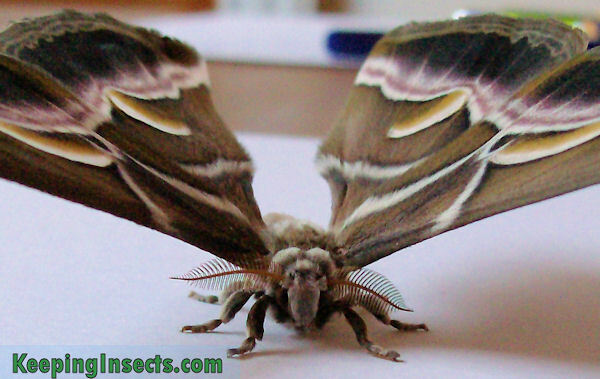 The males of the Ricini Silkmoth are recognizable by the broad feathered antennae. The females have antennae with less “hair” on it. When the moths eclose from their cocoon they will almost immediately start mating. The female lays about 200 to 300 eggs in her life. Do not release eggs, caterpillars or moths into nature. Samia cynthia is not a native species in many countries, so releasing it could disrupt nature. Samia cynthia caterpillars. The green ones are in their first instar stage, the whitish one in its second.